President Trump speaking at the "Unleashing American Energy" event at the Department of Energy in June 2017. 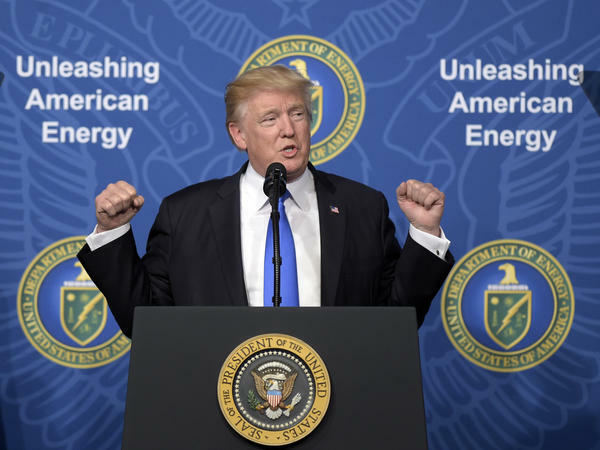 Trump said he wants to reorient toward "American energy dominance." But by two measures there was more oil industry activity on federal lands during the Obama years than Trump's first year. In 2017 the number of oil and gas leases fell to a 10-year low of 38,556. The number of acres leased also declined to a decade-low of 25,742,991. Some of the tables do show more activity. The number of leases issued in 2017 increased by about 42 percent and the number of wells that started drilling increased about 40 percent. These statistics come from the Bureau of Land Management's annual report on the agency's website. The numbers were available last week when NPR obtained them, but a day later they were gone. Acting BLM National Spokesperson Amber Cargile says "major technical issues" across the agency's website were to blame. One of the tables compares the number of acres BLM offered for lease to the number that received bids. It shows the Trump administration offered 11,859,396 acres for lease — more than at any time in the last nine years. But bids were received on only 6.7 percent of them — the lowest share by far over that period. "This administration is throwing as many acres they can at the oil and gas industry and the oil and gas industry, to a large extent, has said, 'No thanks—not right now,' " says Nada Culver, senior counsel and director of the Wilderness Society's BLM Action Center. Environmental groups have long criticized the federal government's oil and gas leasing program in the West, arguing public lands should be managed differently to address climate change and pollution concerns. One reason for the relatively low interest among drillers is where the leases are located. "There are a lot of leases offered in Alaska and Nevada that there hasn't been a lot of interest in," says Kathleen Sgamma, president of the Denver-based oil and gas industry group Western Energy Alliance. Last December the BLM offered all the land available for leasing in the National Petroleum Reserve in Alaska — 10.3 million acres. But drillers bid on less than 1 percent of the leases offered. Sgamma says the response was stronger in drilling hot spots like New Mexico and Wyoming, where most of the parcels offered were leased. She says a more important metric for measuring the Trump administration's progress toward increasing oil and gas production on federal land is revenue from lease sales. In January the BLM announced that the agency "generated nearly $360 million from oil and gas lease sales, an 86 percent increase over the previous year's results of $192.5 million." "That indicates that companies have some confidence that some of these policies that the administration is trying to put into effect will actually bear fruit," Sgamma says. During the Obama years Sgamma says the BLM put up roadblocks for companies that wanted to drill on federal land. She says lengthy environmental reviews and slow agency response times were a big problem for drillers. "The BLM is reviewing and streamlining its business processes to serve its customers and the public better and faster," says BLM spokesperson Cargile. "I think there has been progress. BLM has put in place a new processing system for applications for permit to drill and we're seeing those timelines coming down," says Sgamma. But she says it takes time to change policies and move the bureaucracy in the direction President Trump wants it to go. Beyond administration policies another factor that can boost interest in drilling is oil prices. They are rising and that makes drilling more profitable. So while the Trump administration's effort to boost oil and gas drilling on public land has had mixed results so far, it appears the industry is feeling optimistic about the future.